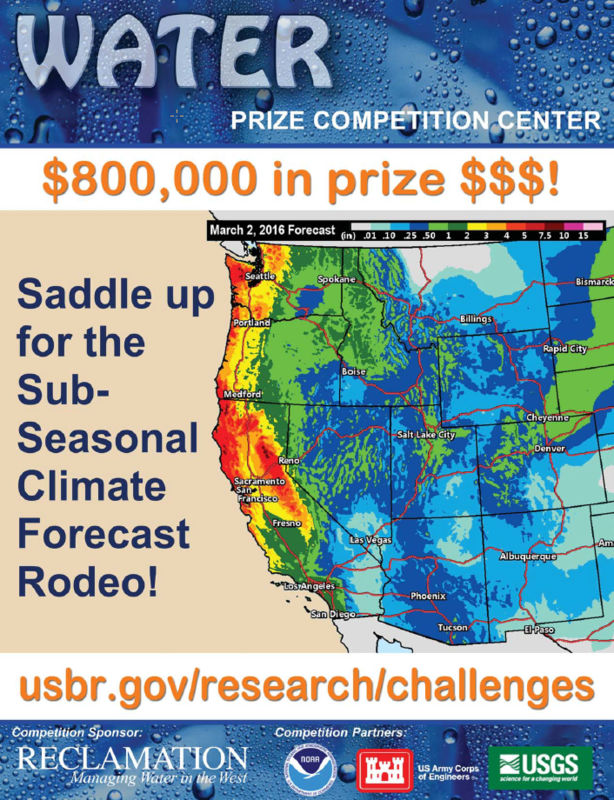 Sub-Seasonal Climate Forecast RodeoWASHINGTON - The Bureau of Reclamation is launching a new prize challenge, Sub-Seasonal Climate Forecast Rodeo, to ask solvers to improve existing sub-seasonal forecasts and to develop systems that perform demonstratively better than the existing baseline forecast for predicting temperature and precipitation over a 15 to 42-day time frame. If there are winners of this prize challenge, they will share up to $800,000 in prize money. Solvers of this prize challenge will have three months to develop their system, at which point they are asked to provide forecasts every two weeks over a 13-month period, with the first month being a "pre-season" to become familiar with the submission and evaluation processes. Improved sub-seasonal forecasts for temperature and precipitation, lead-times ranging from 15 to 45 days and beyond, would allow water managers to better prepare for shifts in hydrologic regimes, such as the onset of drought or occurrence of wet weather extremes. Skillful sub-seasonal forecasting 15 to 45 days in the future has proven difficult to accomplish, because it bridges short-term forecasting, where initial conditions primarily determine upcoming weather, and long-term forecasting in which slowly varying factors such as sea surface temperatures and soil moisture become more important. Reclamation is collaborating with the National Oceanic and Atmospheric Administration Earth System Research Laboratory in Boulder, Colorado, and NOAA's Climate Prediction Center in College Park, Maryland, to design and judge this challenge. In addition, the U.S. Geological Survey and U.S. Army Corps of Engineers contributed subject matter experts to review and assist with the design of this prize challenge. To register and learn more about this prize challenge, visit http://www.challenge.gov. To learn more about Reclamation's Water Prize Challenge Center, visit https://www.usbr.gov/research/challenges/.